Is it a forest of stone? No. Is it a cave without a ceiling? No. Is it even really a canyon? No! Descriptions of Bryce Canyon always seem to fall short, but as you can see, a picture is worth a thousand words. Bryce Canyon’s hoodoos are the park’s main attraction, but how you choose to enjoy them is entirely up to you. Visitors can attend ranger-led geology talks that cover the amphitheater’s unique history. Learn about how the hoodoos, natural arches and other rock formations in the park came to be. Hiking is a popular activity. Some trails go around the rim of Bryce Canyon, and others lead down into the amphitheater itself. During winter months, if conditions are favorable, guests can trek through the canyon on snowshoes. Just be advised that since the park is located high above sea level — more than 7,800 feet — it’s wise not to exert yourself. Remember to drink plenty of water. For a special treat, try one of the park’s enchanting Full Moon Hikes. For those in search of solitude and adventure, there are miles of backcountry trails to explore. While it lacks the sheer magnitude of some other, larger parks, the Bryce Canyon trail system is rather extensive. Do it right and you’ll feel like you know every inch of the canyon. Permits are required for all overnight stays in the backcountry. Bryce Canyon National Park is open all year, but visitor center hours change with each season. Road closures can sometimes follow winter storms, so be sure to check current conditions before you come. The standard entrance fee to Bryce Canyon National Park is $25 per vehicle or $12 per person arriving on foot, bike or motorcycle. Kids aged 15 and younger pay no fee. Fees are good for seven consecutive days. The 114-room Bryce Canyon Lodge is a historic building dating from the 1920s. It was built from local materials and today represents the only hotel-style lodging option in the park. It is open seasonally from April through October. Two campgrounds in the park accommodate visitors that arrive in cars and RVs. Some spots are available through reservation, but most of them are first-come, first-served. Flush toilets and drinking water are provided at each site, and amenities like coin-operated laundry and shower are offered at a nearby general store. In Bryce Canyon, you’re likely to encounter furry critters like the golden-mantled ground squirrel and the Uintah chipmunk. If you’re visiting in the summertime, keep your eyes peeled for colonies of Utah prairie dogs along the road north of the park. In the backcountry, there’s a chance you might catch a rare glimpse of a mountain lion. Just remember to keep your distance form them, especially if you’re traveling with young children. If you’re confronted by a mountain lion, maintain eye contact and slowly back away. Do not run, or the cat will give chase. If it charges, throw rocks and sticks at it and yell. If it attacks you, fight back. The jagged rock formations that line the ridges of Bryce Canyon are called hoodoos, and they are the most prominent features of this eroded natural amphitheater, which was carved out of banded sedimentary rock by wind, water and ice. The reason why Bryce isn’t actually a canyon is because it wasn’t eroded by a source of moving water, such as a river. The reason why it’s become prominent among Utah’s many natural treasures is apparent to even the casual visitor. There is little archeological evidence of prehistoric human habitation in the Bryce Canyon area, but some artifacts from the Ancestral Puebloan and Fremont cultures have been found to the south. These ancient native peoples lived in the American southwest thousands of years ago, and are the earliest horticultural societies on record in that region. Later inhabitants included the Paiute, whose oral tradition holds that the original inhabitants of the canyon were turned to stone as punishment for wickedness by the trickster spirit Coyote. Among the first Mormon settlers of the area were Ebenezer Bryce and his wife, who built a homestead right below the spectacular amphitheater and grazed their cattle within what is now the park. Further settlement was impeded by drought, and by failed attempts to irrigate the canyon. Bryce Canyon National Park was established in 1928, and would benefit greatly from infrastructure improvements by the Union Pacific Railroad and later, public works by the Civilian Conservation Crops. 1872 – U.S. Army scientific expedition explores and maps the canyon. 1874 – 1891 – Mormon settlers — the Bryces among them –found the towns of Clifton, Cannonville, Henrieville and later, Tropic. Most towns would be abandoned. 1916 – 1918 – Union Pacific Railroad promotes Bryce Canyon as a tourist destination. 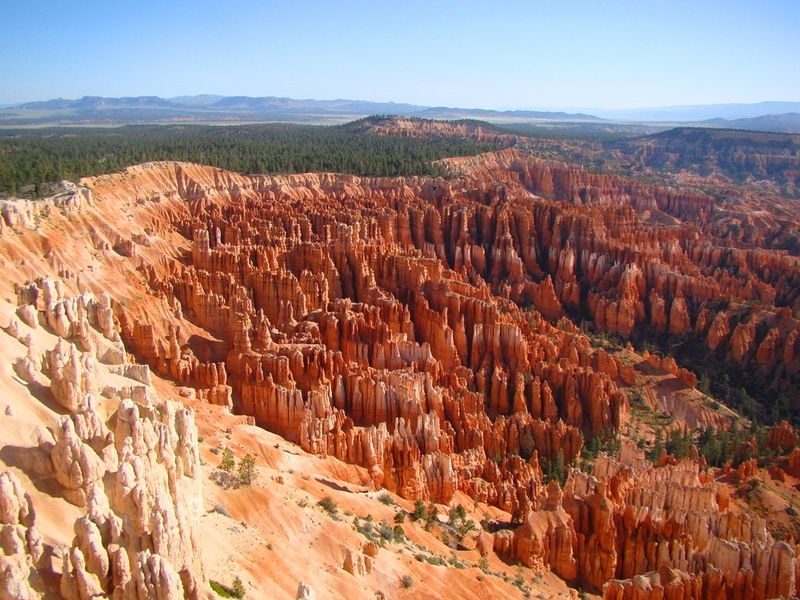 1928 – Bryce Canyon National Park established. 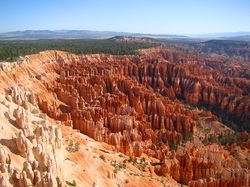 Click to see a detailed Bryce Canyon National Park Map.